Now, I know if you are a fan of The Voice, you didn’t read this title, you sang it! Their catchy jingle makes this show entirely recognizable, and that is only the beginning. 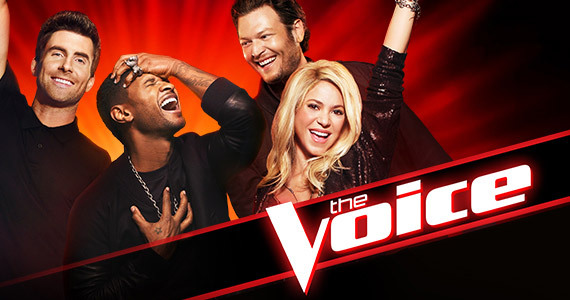 I have been a fan of The Voice since it premiered 3 seasons ago. I thought it was the coolest idea ever! What a concept. Every person who is a contestant is chosen because of their voice. There are no games or gimmicks to get people to watch…it is genuinely because of the voices, and I love that. One factor that makes or breaks this show that most people might not realize is the chemistry between coaches. I won’t lie, I was really worried when Christina and Cee Lo left. I didn’t think that the show would be the same, but I was mistaken. Shakira and Usher are not only bringing their A-Game, but they are hilarious! They fit right in with Adam and Blake, and (dare I say it?) sometimes I like them better than Christina and Cee Lo. The chemistry between the four of them is top notch. My favorite part so far, granted there has only been two shows so far, was when Usher called Nashville a state. Everybody was calling him out and he was so adorable when he realized what he had said. Like I said, with out the chemistry, there would be no show. Now back to the singers! Another reason why I love this show is the amazing opportunities it presents to its’ contestants. Not only is it helpful to work with a supportive, helpful (and of course, famous) coach, but they don’t base it off anything but their voice in the beginning. During the blind auditions, I sometimes think, there is no way that this person would be on American Idol or X Factor because of (insert reason here). I love that they can come on this show and be 100% themselves, and they rock it out! If you are a fan of singing competitions, then you should definitely watch this show. It is a competitive, fun competition, and all of the singers are amazing! PS For all you fans out there – I can not WAIT for the battle rounds! I love the new coaches! Is it just me or is there a little something something going on between Adam and Shakira? Then again maybe Adam just has that with everybody!